Details relating to the Belgian Commemorative of 2009. 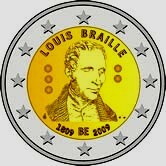 The coin commemorates the 200th birthday of Louis Braille. An accident with an awl condemned Louis Braille to total blindness at an early age of around four years. His love of reading led the courageous young Louis to develop what became known as the Braille script. He thereby gave access to literature and general information to millions of people who would otherwise have been denied it. The coin shows a portrait of Louis Braille. On his left are three dots and on his right two dots. These represent respectively his initials L and B. At the bottom of the inner circle is the symbol “BE” for the issuing country. To the left and right of this are the birth and death years of Braille. To the left of the year of birth is the mint mark – the head of the arch angel Michael. To the right of the year of death is a feather – the mark of the mint master. Return from Belgian Commemorative 2009 to euro coin collector.